The lodge is in need of repairs. Over the years, the building and infrastructure have deteriorated and are in need of repairs. Two main areas have been identified as requiring immediate attention: the septic system and the kitchen. Our septic system is showing its age and has been requiring ever more frequent (and evidently not free) pumpings. Without a new septic system, the lodge simply can’t operate as we wouldn’t be able to cook food for the monthly breakfasts nor operate the bathrooms. Also showing its age is the buidling’s kitchen. 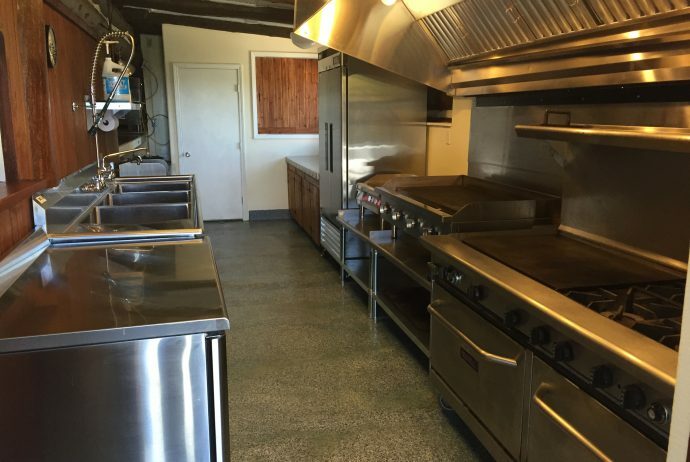 We’ve recently added a new, commercial grade stove, but to serve the 200 to 400 people who come through our doors on the first Sunday of every month requires some needed repairs. The state, as part of its regular inspections, has also identified areas of the kitchen that need repairs and we are working with them to satisfy their requirements. Anyone wishing to make donati.ons may do so by making a deposit to the “Sheriff’s Posse of LA Capital Improvements Account” at LANB in person or over the phone, or by mailing a check to the Los Alamos County Sheriff’s Posse at 650 North Mesa Road, Los Alamos, NM 87544. All donations will be used exclusively for capital improvements. A portion of the already received donations has been used and work on the new septic system is underway. Thank you to all those that have already donated and allowed us to achieve this goal. Next is the kitchen!